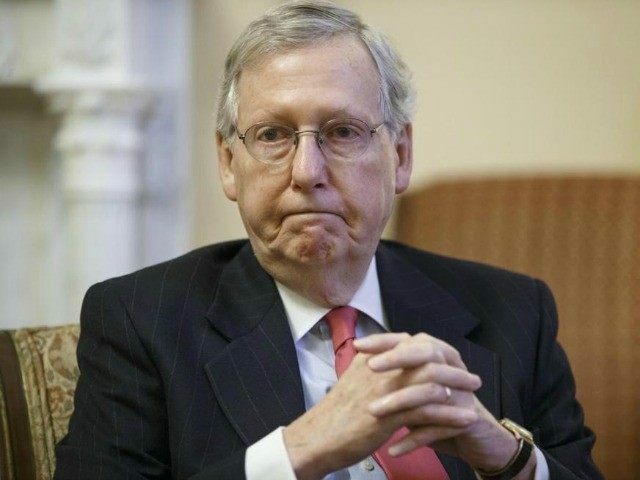 Senate Majority Leader Mitch McConnell (R-KY) is urging Senate Democrats to end their filibuster of the House-passed Department of Homeland Security funding bill now that a federal court has issued a ruling blocking President Obama’s executive amnesty. “This ruling underscores what the President has already acknowledged publicly 22 times: He doesn’t have the authority to take the kinds of actions he once referred to as ‘ignoring the law’ and ‘unwise and unfair,’” McConnell said Tuesday. Monday, a Texas federal court judge temporarily halted Obama’s executive amnesty, ruling in favor of the 26 states challenging the administration’s unilateral actions on immigration. The decision comes as Senate Democrats prevent a House-passed Department of Homeland Security bill — that would defund the president’s executive actions — from coming to the Senate floor for debate. According to McConnell Democrats, particularly those who said they were opposed to executive amnesty, should break their filibuster. “Senate Democrats — specially those who’ve voiced opposition to the President’s executive overreach—should end their partisan filibuster of Department of Homeland Security funding,” he said. Sen. John Thune (R-SD), the chairman of the Senate Republican Conference, reiterated McConnell’s contention. He’s also pressing Senate Democrats to stop blocking debate on the DHS funding bill. “As this case makes its way through the legal process, Senate Democrats have a responsibility to drop their filibuster of the House-passed DHS funding bill,” Thune said Tuesday. Funding for the Department of Homeland Security runs out on February 27. The White House announced early Tuesday morning it plans to appeal the court decision.